Plot When two young college friends fall in love with each other and want to spend the rest of their life together, their caste comes in the way. They run away to start a new life, but the girl’s father gets wind of their whereabouts and does everything in his power to separate the much-in-love couple. When a film happens to be a remake of a certain movie, it is very obvious that parallels would be drawn between the two and the latter would become a subject of minute scrutiny. Shashank Khaitan’s ‘Dhadak’, his third directorial venture after ‘Humpty Sharma Ki Dulhania’ and ‘Badrinath Ki Dulhania’, falls prey to the very problem and fails to leave an imprint. An official remake of Nagraj Manjule’s sleeper hit ‘Sairat’, ‘Dhadak’ follows the same path, albeit with a few changes here and there, but does not have the potential enough to make a mark for itself. ‘Dhadak’ is set in the quaint city of Udaipur, where politics of every kind is the order of the day. A local overlord Ratan Singh (Ashutosh Rana) is continuously bending all rules to overthrow the successful MLA from service so as to come into power. For him, politics and caste count above all else. His daughter Parthavi (Janhvi Kapoor) is a young, outgoing and ambitious girl, who believes in living life to the fullest. 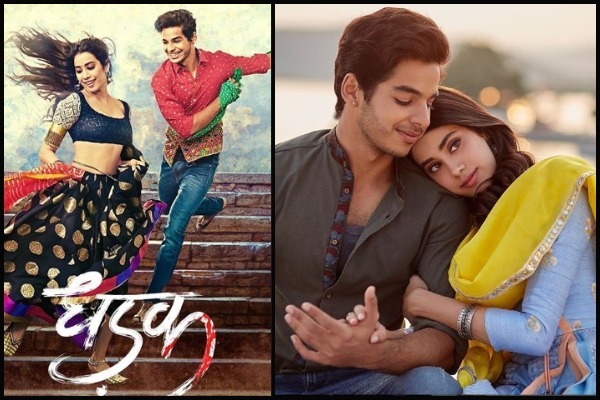 Once she gets into a kachori-eating competition in college, and a classmate, Madhukar Bagla (Ishaan Khatter) falls head over heels in love with her at that very instant. This sets the tone for the rest of the movie. The oft-repeated formula of “boy-meets-girl, both-don’t get-along, fight-and-then-patch-up, fall-in-love”, is applied and ‘Dhadak’ follows the same route, which many other Bollywood movies have tried and tested innumerable times before. While Madhu chases the girl, Parthavi doesn’t like him. She often rebukes and reprimands him for making advances; but with his friendly pestering getting more frequent, Parthavi gives in and both fall in love. While the young lovers start to see other and meet in secret more regularly, news reaches Parthavi’s father, who disapproves of the relationship, for Madhu belongs to a different caste. Although his father is a restaurateur and the family belongs does well, Ratan Singh does not budge. And the only option for the couple is to elope, while the issue of politics and caste heats up in their hometown. Touted as an unconventional love story, ‘Dhadak’ is Khaitan’s effort to bring forth caste-based politics to the fore, which has been done to death on the big screen a lot of times before (recall the recent ‘Ishaqzaade’)! Khaitan adds a few twists in his story, deviating from the simple plot of ‘Sairat’, but that doesn’t help breathe more life into his film either. Right from the word go, ‘Dhadak’ is predictable and lackluster, which mar the smooth flow of the screenplay. One scene that sticks out like a sore thumb is when the lovers run away to Kolkata to start a new life together, they are living under a constant fear of getting caught eventually, but instead they care less about it and break into a song at every beat! Khaitan fails to recreate the same magic with ‘Dhadak’ and his story does not have its heart in the right place, unlike ‘Sairat’. With Dharma Productions stepping in to fund the film, Karan Johar adds a lot of glitz and glamour to an otherwise simple story, which does not suit the theme of the film. There are a lot of other loopholes in the screenplay, which in the end, sends the audience into tedium. As for the cast, Ishaan Khatter oozes confidence and sparkles as Madhukar. He gets his act straight and the young lad is on fire – be it in the emotion department or comedy. A spitting image of his half-brother Shahid Kapoor, Ishaan is a cuter version of the elder sibling and reminds quite a lot of Shahid’s initial days as an actor. With the right career choices, Ishaan will go a long way. Debutante Janhvi on the other hand, is under-confident and needs to polish her skills. She desperately tries hard to get her act together and that shows in her emotional scenes. Ashutosh Rana is in usual form, playing the bad guy with finesse. Kharaj Mukherjee as the kind hostel owner, where the couple stays in Kolkata, adds substance, while Ankit Bisht and Shridhar Watsar as Ishaan’s friends provide comic relief. Despite the fresh, new pairing and the eye-pleasing cinematography, which brings Udaipur, Mumbai and Kolkata to life, ‘Dhadak’ is dull and disappointing. Even Zingat misses the zing, which adds to its misery. There are a few silver linings in the dreary drama, but the negatives nullify all that. All in all, ‘Dhadak’ lacks the emotion and misses a beat!